In the sixth of Anne Perry's charming Christmas novellas, a community learns to come to terms with a terrible event from its past. Emily Radley's Christmas plans are shattered when she learns that her aunt is dying. Although estranged from her, Emily decides that she must journey to Susannah's home in Ireland to assist her in her final days. When she reaches Connemara though, it is evident that Susannah has more on her mind than her health. Then Daniel, the lone survivor of a ship wrecked in a violent storm, seeks refuge in Susannah's house. 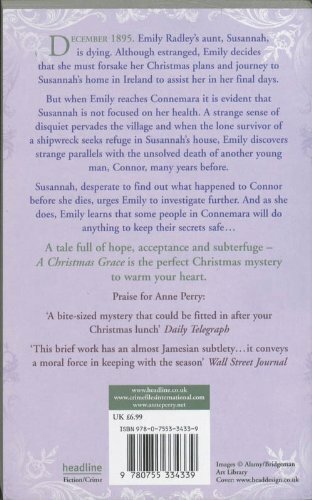 Determined to understand why the village is not welcoming its new arrival, Emily discovers strange parallels with the unsolved death of another young man, Connor, many years before. Susannah, desperate to find out what happened to Connor before she dies, urges Emily to investigate. And as she does, Emily learns that some people will do anything to keep their secrets safe.